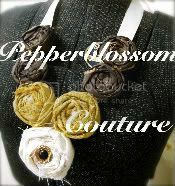 pepperblossom decor: Featured Tomorrow! Dont Miss! Hey there! My name is Danielle and I was wondering how you picked your vendors?? I sell customized blocks and was looking for an open house like this to sell them at! Please let me know my email is danielleimel@yahoo.com thank you! I LOVE all your great ideas!